SINGAPORE - Welcome the Year of the Pig with a show-stopping centrepiece of Leng Saap Moo, a delectable Thai dish of pork spine ribs. This visually arresting platter of stacked ribs covered in a cascade of coriander soup will get your family in the mood for festive feasting. It is a piquant addition to the usual festive fare and bound to be a talking point at your reunion dinner. This is one mountain of pork ribs that is sheer pleasure to conquer. The citrusy tang of lime, the heat from chillies and the fragrance of coriander combine to keep the dish from tasting too porky. 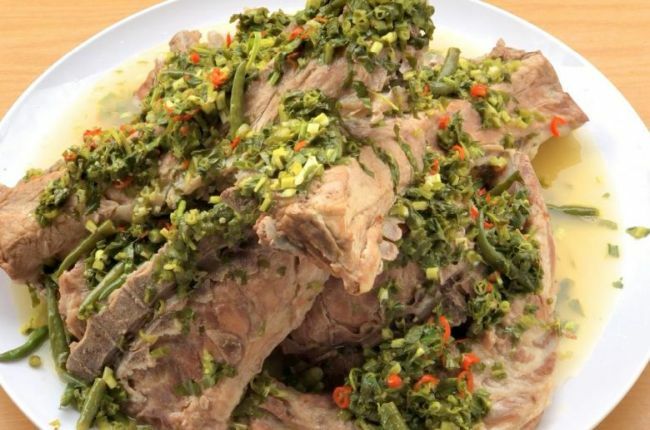 Leng Saap Moo features pork spine, also known as pork loin back ribs. In Mandarin, these ribs are known as long gu, which translates to dragon ribs. Order long gu at the butcher and you will get a grudging "you know your stuff" look of respect from even the surliest butcher. In Chinese cooking, long gu is traditionally used for cooking soups and cut into smaller pieces for ease of boiling. So when ordering at the butcher, be sure to remind him to not chop up the ribs. I cannot emphasise this enough. All three butchers I patronised insisted on chopping up the ribs. Only one of them - a youthful-looking butcher with blue-dyed hair - agreed to leave the ribs whole, upon my insistence. He then guessed correctly that I was planning to cook Leng Saap Moo, obviously a well-kept secret among butchers. There are essentially only two major components to the dish. One is pork ribs and the second is a soup that uses copious amounts of coriander. Before you start, be sure to blanch the ribs to avoid any unpleasant meaty odours. You save yourself the hassle of having to skim scum off the stock later. The ribs are then cooked in a stock that is packed with natural sweetness and flavour from a medley of vegetables. I threw in chicken carcasses for extra flavour. If adding daikon, choose small-sized daikon radishes as these are sweeter than the large ones. A secret that a Thai food fanatic shared with me is to add sugarcane to the stock. Luckily for me, I have pots of purple sugarcane in my garden, but you should be able to get it from the vegetable stall at the wet market. Sugarcane adds incredible natural sweetness to the stock. Save the stock to use for preparing the soup that is poured over the ribs in the final assembly. With all that flavour packed into the stock, the resulting soup is incredibly tasty, livened up further by chillies, lime juice and fish sauce. For a dramatic presentation, complete the dish at the dinner table by ladling the coriander-laden soup over the ribs, in front of your salivating guests. As you pour, remember to cue them to start recording for their social media accounts. Follow Straits Times Food on Instagram @straitstimesfood. If you do try out this recipe, take a photo and share it on Instagram. Use the hashtag #straitstimesfood, mention and tag @straitstimesfood in your post. Happy feasting! You will need a 20-litre pot and a plate with a diameter of 18cm. 1. Fill a pot with 8 litres of water and bring to a boil. 2. Place ribs in pot to blanch until there is no visible blood. Remove the ribs and rinse them. 3. Place chicken carcasses to blanch until there is no visible blood. Remove the carcasses and rinse them. Discard the water. 4. Fill a large (20-litre) pot with 10 litres of water and bring to a boil. 5. Place the coriander roots in the water. 6. Place the daikon, carrot, onion, sugarcane and chicken carcasses in the water. 7. Add the pork ribs. Cover and boil over high heat for 2 hours and 30 minutes. 8. Remove the pork ribs and arrange them on a large plate. 9. Strain the stock, pour 2.5 litres into a clean pot and bring to a boil. 10. Add the green and red chilli padi and bring to a boil. 11. Add the lime juice, Thai palm sugar, fish sauce and let the soup come to a simmering boil. 12. Stir well and turn off the heat. 13. Add the coriander, stir and pour the mixture over the pork ribs. 14. Garnish with the remaining 20g of coriander. Serve immediately.